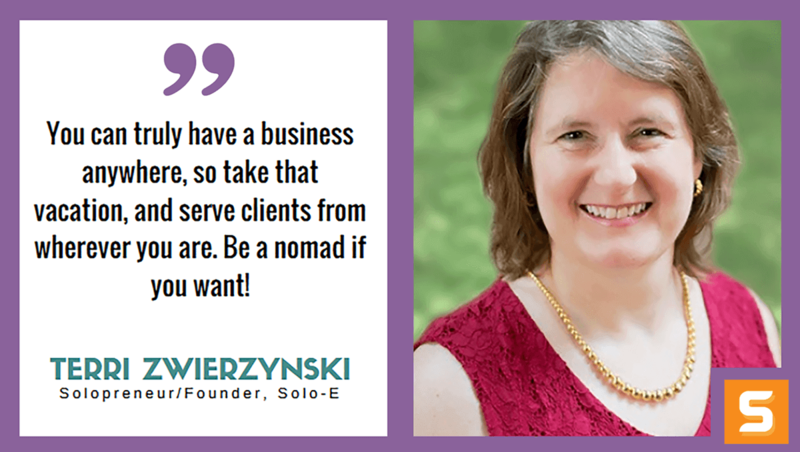 Terri Zwierzynski is a solo entrepreneur advocate. She founded Solo-E.com in 2003 as a resource for solo business owners to grow, even without employees. She recently was named a Trade Ambassador for a new barter network, eBarterExchange.com, and hopes to introduce solo entrepreneurs to the many opportunities that barter can offer. In this Startup Savant interview, Terri shares her perspective on being a solo entrepreneur, why they are different, and how being different can mean being successful. Terri spends most of her social media time on Facebook - follow her there for the latest updates! I was an employee in a "drowning" organization - my colleagues and I were all fed up with bad management decisions, and dreamed out loud of being our own bosses. When I was laid off in 2001, that was the catalyst. As a new solo entrepreneur, I was frustrated by the lack of help available for solo business owners - and decided to start my own resource website. What does Solo-E.com do that makes it better than the rest? In other words, what is your competitive advantage and how did you find it? This one is easy - we focus solely on helping solo entrepreneurs build their businesses without employees. Solo business owners are different - we don't want to "hire" people, we don't want to worry about payroll and employee manuals. And - I'm my own market. I know exactly what the challenges are, and I know how sort out the people who can help from the hucksters who just want to sell you something. Eat. LOL! We can get so caught up in whatever we are doing, that we literally forget to eat. I've learned to keep water handy to stay hydrated, and have easy access to something nutritious, like trail mix. A typical day? I don't think there is such a thing! When my kids were younger, I was determined to be there for them. Now, I have days where I get nothing done, and days when I work around the clock. I started my business with a partner. I lacked the confidence to do it myself. That was a disaster, we had different expectation and priorities. I bought her out and built the business the way I felt was best. I learned not to completely rely on someone else. But I don't do it alone - I have a great virtual support team who handles customer support, newsletter creation, and much more. No long-term promises, but still a lot of trust. My kids - I want to show them that they don't have to work for "the Man" in order to be successful. And that they can do what they love, not get caught up in the daily grind. I'm quite persistent. If there is a challenge, there is always a way around it. I've been through several years of unprofitability, but I'm relentless in proving that I can make it work. What are the top 3 success tips that you would give anyone starting a business in North Carolina? 1) Think bigger. Think beyond North Carolina. Think beyond North America! The Internet makes it possible to find customers just about anywhere. 2) Do it your way. Never let yourself be constrained by "this is the way we do it" thinking. 3) You can truly have a business anywhere, so take that vacation, and serve clients from wherever you are. Be a nomad if you want! I love TeuxDeux.com to keep track of my to-do list. It automatically rolls over whatever I don't finish today to the next day. And Google Calendar. It sends me reminders. Plus it's the only way to keep track of what the whole family is doing! I want to achieve a consistent income - no more roller coaster. And I want to have enough money to pay off my kids' loans, have the financial resources to weather future downturns, and add significantly to our retirement funds. And I want to inspire a million solo entrepreneurs to be successful, control their destiny, and keep doing what they love.